I was well-intentioned, though, and their safe captivity inside building machinery probably kept them safe from other predators so perhaps it all evened out in the end. I was intrigued by everything in nature. Yes, you might say I’m a nerd. But aren’t all children nerds in a way — open to fascination and excitement and to soaking up knowledge about the world — especially if it’s shown to them in an interesting way. For many years I visited schools to talk about nature through the wonderful Heritage in Schools Scheme, and it always struck me how excited the children would get over a new fact or photograph, video or animal sound I played for them. I spoke to them about my time working on natural history documentaries — about how I worked with camera crews filming deer, bats puffins, or fin whales around Ireland. I told simple stories of my treasured interactions with wild animals. But one poignant aspect of these school visits was seeing how little the children knew about our Irish wildlife. Without fail there was always someone in the group who would shout out ‘Skunk!’ to a picture of a good old-fashioned Irish badger. They had never heard of a pine marten, couldn’t identify common garden birds, or name a tree, and were nervous of touching any of the insects we looked at in the schoolyard. Kids today often know lots about Antarctica, or African wildlife or dinosaurs. But they don’t seem to know what’s on their doorstep, or how amazing Irish wildlife is, too. It was this experience that led to The Great Big Book of Irish Wildlife. I wanted to write a very accessible book, to introduce young children to our diversity of wonderful wildlife — in a fun way — and to explain some of the changes in nature across the Irish seasons. Our children are bombarded by negative stories about the environment, with scary statistics about climate change, plastic pollution and endangered species. I wanted my book to be positive. I wanted to provide an insight into the life stories, and amazing abilities of some of Ireland’s beautiful birds, mammals and insects, and hopefully whet the readers’ appetite to want to get out and explore for themselves. 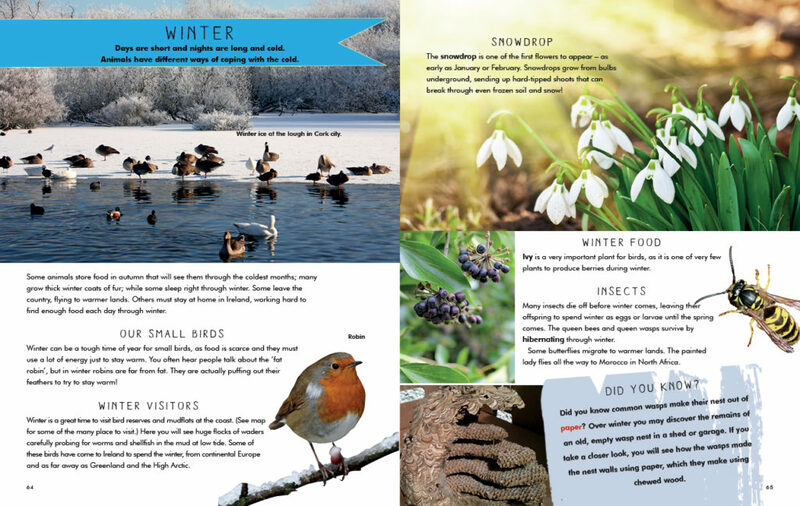 As well as explaining some of the most dramatic wildlife events of each season, such as the red deer rut in autumn, a starling murmuration in winter or giant basking sharks cruising Irish waters in summer, I also wanted to show children what common wildlife sights they could experience easily for themselves in their own back yard or in their local park. You often hear of our ‘disconnect with nature’ nowadays. I regularly meet people who want to develop a stronger connection with nature, but don’t know where to start. So in the book, I make lots of suggestions. 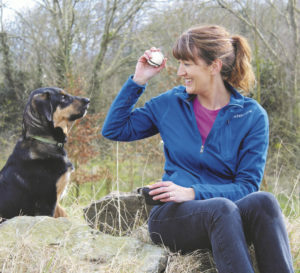 We have some amazing wildlife NGOs in this country, such as BirdWatch Ireland, the Irish Whale and Dolphin Group or Bat Conservation Ireland, who offer free events from bat walks to whalewatching. By following the lead of an expert guide, you have a mentor on hand to show you how and where to look and there is no better way to learn. Feeding the birds is a great way of welcoming wildlife to your garden and a great way to learn to identify our common garden birds. Winter can be a tough time of year for small birds, as food is scarce and they must use a lot of energy just to stay warm. You often hear people talk about the ‘fat robin’, but in winter robins are far from fat. They are actually puffing out their feathers to try to stay warm! Winter can also be a good time to spot old nests in trees and hedgerows, without the leaves to hide them. You can spot the large stick nests of rooks and you might even be able to spot a squirrel drey – a sphere of twigs up high in a woodland tree. If you can visit a rookery (the colonial winter roost of rooks and jackdaws), the sound and experience may surprise you, as hundreds of birds roost together at night to help stay warm and safe. If you hear of a local winter site for a starling murmuration, make the trip and watch the skies from an hour or two before dark. It will be well worth it. The swirling, pulsating cloud of birds that is a murmuration is one of the most amazing winter sights! Keep an eye on BirdWatch Ireland’s Facebook page for updates. Wader Watching at an estuary or on mudflats, such as at North Bull Island in Dublin, is also a great activity to try out over winter. Here, you will see large numbers of waders carefully probing for worms and shellfish in the mud at low tide. Different waders have different bill designs and lengths to allow them to reach a variety of prey under the mud. The curlew is our largest wader with the longest bill to reach lugworms and ragworms that tunnel deep into the mud, while turnstones turn over stones, clumps of seaweed and pebbles to catch invertebrates hiding underneath. Some of these birds have come to Ireland to spend the winter, from continental Europe and as far away as Greenland and the High Arctic. Bring binoculars if you can and a good bird book. Check the tide times online. Find a good spot an hour before high tide and you’ll see the birds as they come closer with the tide, and then spread out over the mudflats as the tide goes out. Leave dogs at home when you go wildlife watching! In the UK, doctors are now writing ‘green prescriptions’, encouraging time spent in nature to help your mental health as well as physical fitness. In Japan, it’s called ‘forest-bathing’ and is recognised to restore health. This link between nature and wellbeing is becoming more recognised globally, and in fact the more biodiverse an area, the more benefits are seen. I know myself when I get out into a ‘wild place’ or even a green space in an urban setting, I immediately feel better. An introduction to the outdoors and wildlife is one of the greatest gifts we could give to our children. I really hope the Great Big Book of Irish Wildlife opens that door for some young readers. They may not start growing tadpoles in cannibalistic settings, but they may just start to see the wonder of nature and the joy to be had in the outdoors.